Before he became the 22nd…and 24th President of the United States, Grover Cleveland was Mayor of Buffalo. Those two facts about Cleveland, by themselves, bring to mind a hockey player who was a “carpenter” who served two separate tours as a member of the Washington Capitals: Bobby Carpenter. Steven Grover Cleveland was born in New Jersey, the fifth of nine children, but his family moved to upstate New York in his early teens. After leaving school to work after his father passed away, he moved to Buffalo. There he obtained a clerkship at a local law firm, was subsequently admitted to the bar, and began a career as a lawyer, eventually starting his own practice. It was during this period that he became involved in Democratic Party politics, and after losing an election for district attorney, won election as county sheriff. He served only two years in that position before returning to private practice, but in 1882 he decided to run as a reform candidate for Mayor of Buffalo and won. He served only ten months, spending most of it fighting with local political machines, moving on to a run for Governor. He won the party nomination and won the subsequent general election. His two year term was characterized by a fiscal conservatism and a willingness to root out corruption. Those battles in the governor’s office were not the worst way to prepare for a national campaign, as it turned out, as the Democratic nominating convention was split after Samuel Tilden declined nomination, citing poor health. 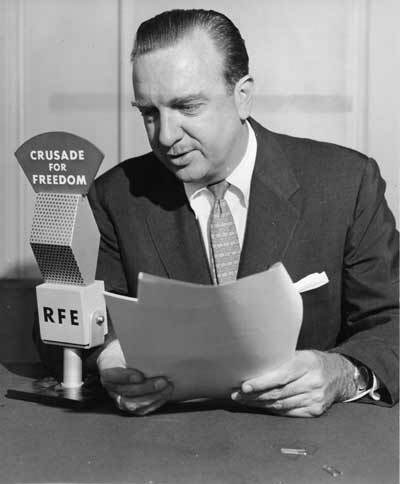 Cleveland emerged as a favorite and won the nomination on the second ballot after a first ballot with ten candidates receiving votes did not yield a winner. Although the general election was setting up as a close one, Cleveland did have an ace up his sleeve than made him a “can’t miss” prospect: New York’s 36 electoral votes. The election fractured along regional lines, Cleveland taking the South and Republican James G. Blaine winning most of the North. The split left Cleveland with 183 electoral votes and Blaine with 182. But Cleveland won the New York prize, the 36 electoral votes, and the Presidency despite winning the popular vote by fewer than 60,000 of more than ten million votes cast. Cleveland took office intent on pushing civil service reform, using a merit-based method for appointments. His reform attitude extended to contracts for naval construction, interstate commerce (the Interstate Commerce Commission was established under his administration), and land interests. He took on Congress on spending across a range of areas, promoted reductions in tariffs, and argued for adherence to a gold standard. His re-election effort in 1888 was hampered as much by the management of his campaign (poor) as it was a product of policy differences with Republicans. Because of political divisions in New York, the state that gave him the 1884 election flipped in 1888, and despite winning the popular vote by more than 90,000 of more than 11 million votes cast, Cleveland was defeated soundly by Benjamin Harrison in the Electoral College, 233-168. Had he won New York’s 36 electoral votes, denying them to Harrison, Cleveland would have won. Cleveland did not retire to private life permanently. Finding himself at odds with Harrison on the matter of reform, he ran for the Democratic Party nomination in 1892 and won on the first ballot, albeit narrowly over challenger David Hill, a Tammany Hall backed candidate. In a rerun of the election of 1888, Cleveland and Harrison faced off, this time with Cleveland winning by more than 350,000 votes in the popular vote and by a 277-145 margin in the Electoral College. Cleveland’s second term proved to be more difficult than his first, starting with having to confront the Panic of 1893 shortly after he took office. When the panic became an economic depression, Cleveland and Congress could not agree on a remedy, a problem exacerbated by a gold shortage. Cleveland was successful in reversing Harrison’s policy on silver as a basis for currency, but he shortly found himself at odds with Congress on tariff policy. The problems snowballed, as labor took issue with Cleveland’s views on silver, the resulting weakening of currency affecting availability of funds for public works projects and to assist farmers in retiring their debts. Business failures, a depressed farm economy, unemployment resisted solutions and affected Cleveland’s popularity. It made for a difficult situation as Cleveland prepared for the election of 1896, one that his enemies in the party were able to exploit, denying him the nomination and choosing William Jennings Bryan in his stead. After returning to private life, there were murmurs of a run for the United States Senate, but he did not run for office again. He died in June 1908 in Princeton, New Jersey. 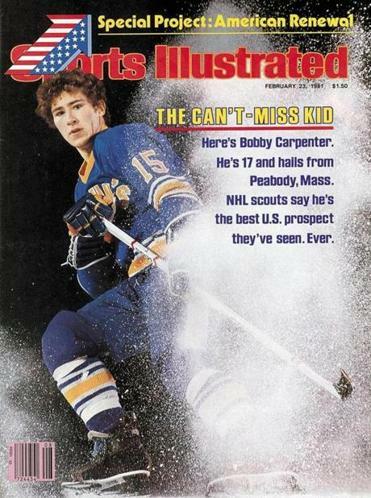 Bobby Carpenter was a “can’t miss” prospect of his own, dubbed as such in February 1981 by Sports Illustrated magazine, the first American-born hockey player to land on the Sports Illustrated cover. When the Capitals took the Massachusetts native with the third overall pick in the 1981 Entry Draft, it was the highest an American had ever been drafted in the NHL, and when he won a roster spot for the 1981-1982 season, he became the first player to make the jump from high school directly to the NHL. Carpenter did not disappoint in his rookie season with the Caps, finishing with 32 goals in the 1981-1982 season (fifth among first year players) and 67 points. He followed that up with 32 goals the following year and 28 more in 1983-1984. To that point in NHL history, he was one of three players 20 years old or younger who posted a career total of 90 or more goals. In addition to Carpenter’s 92 goals, the others were Dale Hawerchuk (122) and Wayne Gretzky (106). When Carpenter scored 53 goals in 1984-1985, the first American-born player to hit the 50-goal mark, he was on a career path that seemed unlimited. As good as things appeared for Carpenter, though, there were problems. Head coach Bryan Murray thought Carpenter, drafted as a center, was better suited to playing left wing. Carpenter chafed at the way he was being used, and his relationship with the head coach soured. After seeing his goal total drop to 27 in the 1985-1986 season, he and the club got off to a poor start in the 1986-1987 season. When the Caps lost to the Pittsburgh Penguins, 5-4, on November 22nd, it extended a winless streak to seven games and left the Caps with a 7-11-4 record and fifth place in a six-team Patrick Division. Carpenter played in all 22 games to that point, going a disappointing 5-7-12, minus-7. Worse, his situation with Murray had become toxic. Two days later, General Manager David Poile suggested that the Caps and Carpenter go their separate ways. Carpenter, whose consecutive games-played streak reached 422 (then a team record, since broken by Karl Alzner) since he played his first game with the Caps, was now sitting at home, waiting on a trade. That trade came on New Year’s Day 1987, Carpenter and a second round draft pick sent to the New York Rangers for Bob Crawford, Kelly Miller, and Mike Ridley in one of the more consequential trades in team history. For his part, Carpenter did not mince words on his way out the door about his relationship with Murray. Carpenter lasted just 28 games with the Rangers before he was on the move again, traded to the Los Angeles Kings in March with Tom Laidlaw for Jeff Crossman, Marcel Dionne and a third round pick in the 1989 Entry Draft. He spent parts of three seasons in California before he was traded once more, this time to the Boston Bruins for Steve Kasper and Jay Miller. Once the “Can’t Miss Kid” of Peabody, Carpenter returned to the Boston area late in the 1988-1989 season not having reached the 20-goal mark in a season since leaving the Caps, scoring just 34 goals in 148 games. “Can’t miss” was not a term one would use to describe Carpenter, even if he was still just 25 years old. He rebounded to score 25 goals in 80 games for Boston in 1989-1990, but he played in just 29 games the following season due to his shattering his kneecap. Carpenter returned to play in 60 games in 1991-1992 and scored 25 goals for the Bruins, but it would be his last season in Boston. "A lot changes in six years. It was just a mistake, what happened. . . . It's a lot different when you play six years -- it's six more years in different places -- you realize different things. It was just a misunderstanding that got blown way out of proportion. I don't think it was as serious as everyone made it out to be. 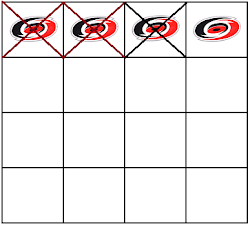 I had some talks with Bryan [Murray], and we patched things up pretty good. We don't have any problems at all anymore. I hope they can get over it; I sure have. It was a bad situation, a misunderstanding, and it's over with." Carpenter was just short of his 29th birthday. 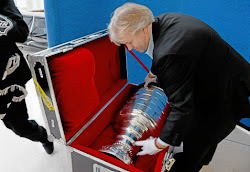 In what should have been the prime of his career, Carpenter was a shell of the player who once scored 50 goals for the Caps. He started the season without a goal in his first 15 games, and in 68 games played for the season he went 11-17-28, his minus-16 being worst on the club. The Caps did not re-sign Carpenter, and he ended up getting a try-out deal without compensation with the New Jersey Devils in September 1993. He won a roster spot with the Devils and played in 353 regular season and 60 postseason games with the club over six seasons, winning a Stanley Cup with them in 1995. After the 1998-1999 season, having played in 1,178 regular season games (490 with the Caps) and 140 postseason games (26 with Washington), Carpenter’s NHL career came to an end at the age of 35. Grover Cleveland and Bobby Carpenter both came to their roles in Washington with clear ideas of what they wanted to do and how they should fulfill those roles. Cleveland ended up fighting with a resistant Congress, Carpenter ended up resentful of his head coach. They left under difficult circumstances, but they would later return for a second tour in Washington, somewhat humbled but neither quite up to the task of what their positions demanded. As much as any President and Capital, Cleveland and Carpenter experienced similar paths in their two tours in the Nation’s Capital.